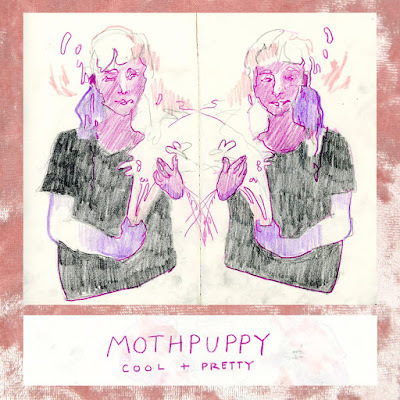 Mothpuppy leaps to new heights on their first full band recording. If you follow the Falling Branch Trail in Pylesville, Maryland, take a left after crossing the wooden footbridge, and make your way across the smooth stepping stones that dot the stream, you'll reach Kilgore Falls, the second highest waterfall in the state. The swimming hole there is (according to the intrepid hikers at alltrails.com) almost unbearably cold but, nevertheless, the grotto makes for an idyllic summer afternoon. You can sit on the side of the rocks with some food, maybe, and make a picnic out of people-watching. If you’re feeling adventurous, you can clamber up the side of the waterfall and take in the view of the state park as the sound of rushing water fills your ears. Kilgore Falls is, according to Google Maps, about a 45-minute drive from Goucher College, where, in a dorm room, Morgan Murphy began releasing their demos and sketches as Mothpuppy (a name derived from, in their view, an ill-conceived Snapchat handle). These early releases, including 2015’s Camp Hero, featured little more than a guitar and some auxiliary instrumentation surrounding Murphy’s words and melodies. But even these bedroom recordings showed off the full force of their lyrical talents. “Camp Hero State Park” rings true as an ode to the inner struggle between the beauty of nature and summer camp-induced homesickness, and “Becca,” in addressing a friend in pain, hits the sweet spot between tenderness and melancholy. “Kilgore Falls” is also the name, and subject, of the opening track of Mothpuppy’s new album, Cool and Pretty. The album is the first to feature a full band, and the new depth of instrumentation is the perfect delivery vehicle for Murphy’s stories. Where once they seemed private and whispered, in this new context they become anthemic and cathartic. Lyrically, Murphy’s songs deal with their uncertainties about such topics as body dysmorphia, self-confidence, and mortality. Heady subjects to be sure, but, in some songs, Murphy frames and molds them through the eyes of other characters. In the off-kilter highlight “Basketball Court,” Murphy is an uncertain eleven-year-old, wondering, “What is it about my body that makes my head hurt? / My hips are wider than my waist.” The song’s verses tilt and meander, and Pavement-esque languid, detuned guitars give the song feeling of a woozy, hazy recollection. But the memories they recount are achingly vivid: “I threw some rocks in the river / It meant nothing to me then / He took a quick video he’s probably deleted since.” The most striking recollections one has of childhood often stem from the most jarring events. In writing and singing through these thoughts, Murphy grapples out loud with their power in an attempt to reconcile them. “Flea” imagines the titular parasite as a wistful ghost, wondering about the object of its affection and their passionless squishing of its bug body. The song builds to an addictive climax, no small feat for a song about a bloodsucking insect. Several songs here are re-purposed from Camp Hero, and the added instruments - courtesy of friends and fellow Goucher students Ryan Vieira, Becca Kotula, Shawn Durham, and Becca Willis - and production value give each a welcome heft and power. “Abbreviation,” in its earlier incarnation, paired a pointedly rageful address to a frustrating partner with a campfire-style group singalong, but on Cool and Pretty the song morphs into muscular rock. “Trash Day” and “Joan” shed some of their previous quirk and, in doing so, further highlight Murphy’s weighty words and memorable melodies. But it's in “Follow Thru,” the new album’s centerpiece, where Murphy and their backing band truly click. The version on Camp Hero slowly grows in volume and urgency, yet when the emphatic chorus hits - “I will fall whenever you want me to hit the ground”- the music reaches for, but does not reach, the same power. But in the rerecording, the song gets loud during that line, the words hitting as hard as the image of the jumper. Murphy’s voice, too, transforms into a snarl, a desperate invocation. It is the most powerful moment of the album, and one only possible through the band’s newfound instrumental chops. There is a line in “Kilgore Falls”- at first glance an ode to the well-documented beauty of the area, and a desire to spend some time with an missed friend - that to me represents Murphy’s struggle, in this and all their songs, to define the complexities that put pen to paper and hand to guitar. “All of my songs are just letters / and I hope they reach you someday.” Listening to Cool and Pretty, one feels the powerful truth of this sentiment. Throughout these eleven songs, Murphy no longer whispers their self-doubts. With the support of a soaring, anthemic backing band, they shout them loud enough for the subjects of their letters - and, graciously, us strangers - to sit down and listen.